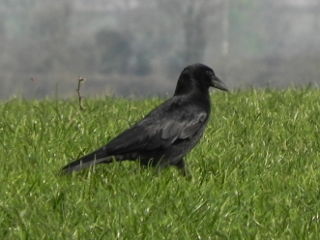 This looks like a crow to me – mind you so do all the other black birds – except the blackbird of course. This guy was on his own in the field. 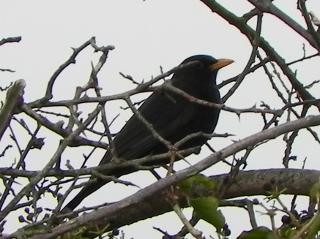 There was another black bird quite a distance away – certainly not within caw-ling distance. At one time, in my slothful youth, when I noticed one of these guys pacing along the grass verge as I drove past in the car – I always imagined that they had probably dropped a contact lens somewhere and were doing their best to find it with only one eye. On closer acquaintance I now know that this is not the case. Nor are they lost in deep philosophical ruminations. No, they are just grumpy old sods that find other people irritating. Well, here’s further proof – if proof were needed – that not being able to see that well and just pointing the camera and pressing the button in hope can pay off. Look at what we have here. 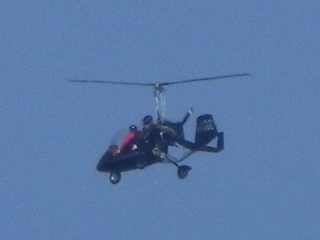 A two seater, minicopter sort of thing. Who’d have thought that that thing buzzing around in the sky would have turned out to be something interesting rather than just something annoying? But what were they doing pottering around over us? Counting sheep? Better done in bed than when flying an aircraft. Looking for fires? Sorry, wrong side of The Solway – and I think they’ve managed to put them all out now. It was a lovely sunny day – although a little chilly – perhaps they were just taking advantage of the good flying weather? 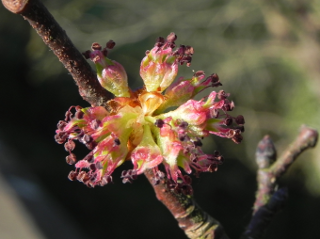 Well not really further developments – but we do have a new picture of the elm flowers. I think they must be coming to an end now. They’ve gone from a tight ball to something that looks like a (very) miniature bunch of tulips. Mrs. Grieve mentions that the wood of the elm is very hard and particularly resistant to water and has been used for making water pipes in the past. She lists a few medicinal uses for the bark too. With so many elm trees dying of Dutch Elm Disease I was really pleased to find this tree. There’s not a lot of them about now. There’s another nice thing about this particular tree and that is, that it is growing down in the ‘gorge’ that the river has cut for itself and right next to the bridge – so I walk right past, and can reach out and touch, the very top of the tree. We’re on very friendly terms. Well at last! 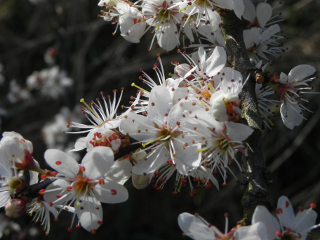 We have found some Blackthorn flowers! Spring is here! Admittedly The Dog and I had to travel a little far afield before we came across them but still they are within our circuit – in a hedge up by the main road, actually. A noisy smelly place full of traffic and exhaust fumes so we don’t often go that far – but we did today and were rewarded with a scattering of white flowers in one of the hedges. We’ve had the white of the Snowdrops, we’ve had the yellow of the Daffodils, we’ve had the yellow of the Celandine now we go in for the white bushes that take us through to the May (hopefully in May – although some Hawthorns don’t seem to have received this years calendar and are well on in leaf) We have had some brilliant weather, warm – in fact hot in the sun – with clear skies and not enough wind to turn the windmills – no feed in tariff feeding in here! for rain. A lone cloud? Oh, no. As we wander the highways and byways (as in, walk round the block) The Dog and I have noticed the large number of large black birds in the fields and on the chimney pots. As the trees have been standing around in their pyjamas for these past few months, it’s been possible to see the large clumps of twigs that sit amongst the branches of a few of the larger of them. These would suggest a rookery. So you would expect that the black birds we see are rooks. 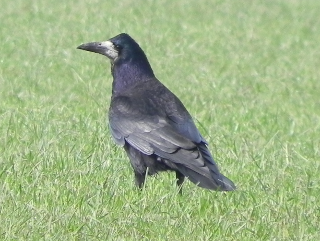 Rooks are sociable birds – they say – and are always seen in flocks or small groups. This guy must have woken up this morning with a headache. He was on his own in the middle of a field – he probably just couldn’t take the racket that the rest of the flock (or parliament if you want to sound as if you know what you’re talking about and don’t care that nobody else understands you) were making. I thought – just to keep the record straight we ought to start with a black bird who is a blackbird. He is of course the most consummate musician and, as so many gifted people are, he is a little opinionated. He is about jazz, man – freedom, expression, being yourself and letting the music flow! He doesn’t do the dots – thinks it must be too boring for words to just play what someone else has written out for you – how would they know how you feel? He absolutely despises that other great musician of the bird world, The Robin. That dismal, whining, folksy, protest stuff just does not do it for him. I once watched a robin and a blackbird on the lawn. The robin found a worm and set about heaving it out of its wormhole. Immediately the blackbird, with a loud tuk, tuk, tuk and great great fluttering of wings, dive bombed the robin and chased him off – he then finished pulling the worm up and ate it himself.